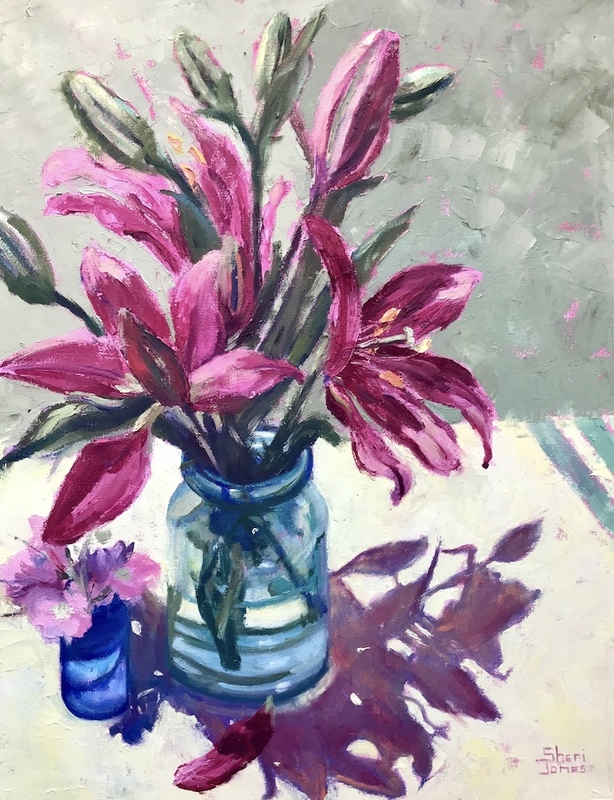 These ruby lilies really warmed my heart and made me want to paint them. I set the flowers out in the bright sun to create deep shadows.. The shadow they cast was as alluring as the flowers. Spring flowers make me happy! Katherine Martinez, Sheri Jones, Kay Wyne, Kyle Wood, Layne Johnson and Rebecca Zook. I plan to be there Saturday, April 27th-9 am- 5:pm. Stop by and check out the beautiful flowers and artwork. I took advantage of my blooming flowers from the garden. 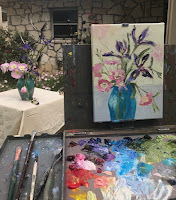 Painting in garden listening to the birds sing is a peaceful place to spend the day. This is my happy place. I plan to be there Saturday, April 27th-9 am- 5:pm. 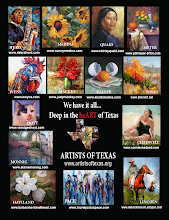 Stop by and check out the beautiful artwork. 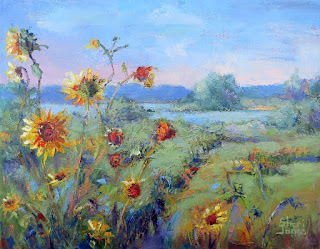 To see more http://www.sherijonesart.com Sheri@sherijonesart.com http://www.sheriart.blogspot.com. Thank you for viewing my art. I painted this from a photo my husband, BJ took in Roussillion, France. This pup was living the the life. I have been doing a series of dog paintings and would love to paint your fur baby. They also make great gifts. I painted this for a dear friend and neighbor. I watched Kayla grow up and painted this for her. I presented it to her at her wedding show and it brought her to tears. Today is her wedding day and we shall celebrate her and hubbies joyful future. Kevin started it...I will create a series of fur babies. Please let me know if you are interested in a painting of your or loved ones pet. 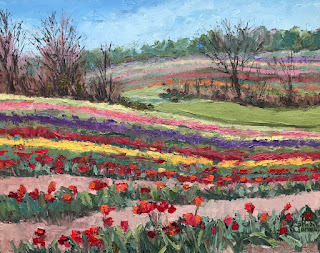 This painting was inspired from the tulip farm I visited recently. I was crazy for all this color and couldn't wait to get home and explore this subject more. 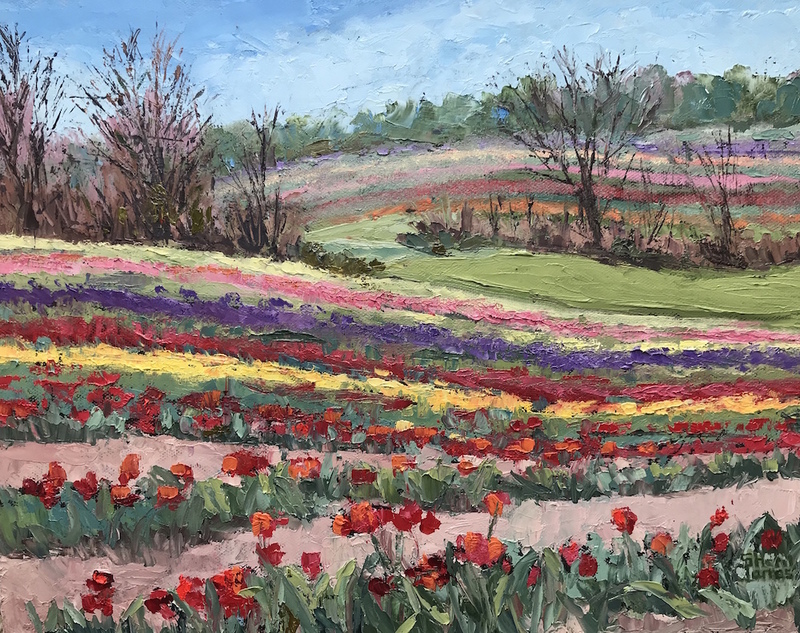 I was fortunate to paint color studies at the Poston's Nursery in Waxahachie during the tulip show and sale. I have studied painting and glass work for over 25 years, constantly learning from diverse artists and workshops. I consider myself a colorist and feel it speaks volumes in whatever medium or subject I choose to use. My goal is to push boundaries, growing through experimentation, variety and brush mileage. 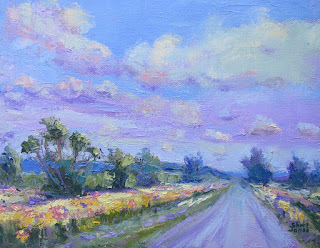 My recent inspirations come from plein air work. Painting outdoors or working from life has proven to be an exhilarating and challenging experience. I am inspired to record my observations and experiences on canvas. 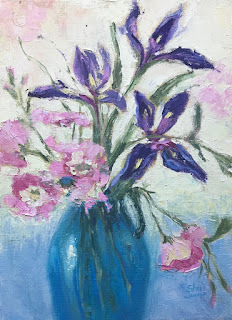 I hope as you view my work, you will sense the pleasure I receive from the painting process and my gratitude to God for the artistic ability He has given me.